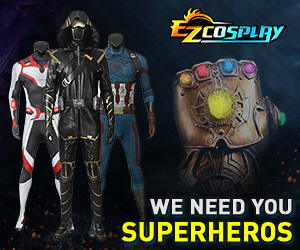 Welcome to Cosplay.com! Will you be wearing your Plusle on Friday for the Pokemon group? I'll be there after work on Friday, then both Saturday and Sunday. I'll be bringing my Gankutsuou costume, Rogue from X-men, and anything else that looks good since I have trouble staying on topic with just anime-oriented costumes. Miss Creeper/The Creeper from DC Comics, most days. Nick from Left 4 Dead 2, Saturday. Tres Iqus from Trinity Blood for a photoshoot on Friday night. I am wanting to bring another cosplay but I am unsure what.... maybe Lelouch. Friday cosplay is all up in the air. I'm bringing Amanda from MGS Peace Walker, Jill (BSAA) from RE5, Meryl from MGS4, Sweet Snake (figuremate) from MGS4. I'm might possibly bring Ginjinka Arcanine as well. Really depends on how much space I have to pack stuff because I'm more worried about products for my art table. I'll be coming this year. Cosplays for Friday and Saturday are kind of in the air, but Sunday for certain I"m bringing my Captain Hans for possibly his last year, for the Hellsing shoot. FFFFFFFFUUUUU YOU HAVE FOUND OUT MY SECRET! Love you too. @Kate: I'd love to see your Arcanine in person ^_^. [QUOTE=Lightane;4103090]Aww sad news, like ~H~ said you'll be missed! awww EBK thats to bad! I hope to see you next year though. and a ring wraith from Lord of the rings. Hate to break my streak of attending since 2004, but funds are tight and I have Dragon*Con the weekend before. I have gone to both cons back-to-back each year, but this year it's just not possible for NDK. Ah! I was hoping to finally meet you. ;A; Seemed like a cool guy! Drat. Maybe next year? Have a good time at D*C! I will be there on Saturday & Sunday as fem!Romano [Hetalia] and Matryoshka!Russia, respectively.